Microwires are manufactured by means of a modified Taylor-Ulitovsky process [1-5] based on direct casting from the melt, as schematically depicted in Fig. 1. 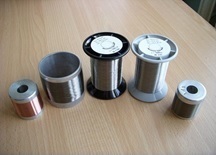 In the laboratory process, a few grams of the master alloy with the desired composition is put into a glass tube and placed within a high frequency inductor heater. The alloy is heated up to its melting point, forming a droplet. While the metal melts, the portion of the glass tube adjacent to the melting metal softens, enveloping the metal droplet. A glass capillary is then drawn from the softened glass portion and wound on a rotating coil. At suitable drawing conditions, the molten metal fills the glass capillary and a microwire is thus formed where the metal core is completely coated by a glass shell. The amount of glass used in the process is balanced by the continous feeding of the glass tube through the inductor zone, whereas the formation of the metallic core is restricted by the initial quantity of the master alloy droplet. The microstructure of a microwire (and hence, its properties) depends mainly on the cooling rate, which can be controlled by a cooling mechanism when the metal-filled capillary enters into a stream of cooling liquid (water or oil) on its way to the receiving coil. G.F. Taylor, Process and apparatus for making Filaments, Patented Feb. 24, 1931, United States Patent Office, 1, 793, 529. A.V. Ulitovsky, in "Micro-technology in design of electric devices", Leningrad, 1951, No.7, p.6.